Mexico City, Nov 6 2018 - Each year, the Caravana de Madres de Migrantes Desaparecidos (Caravan of Mothers of Missing Migrants) crosses Mexican territory in search of their children who went missing trying to reach the United States. 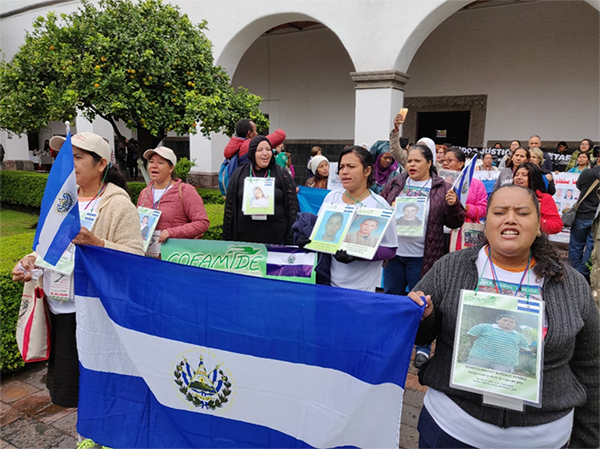 For the first time, the Mothers’ Caravan was joined in Mexico City by mothers from other continents, with the aim of building a transnational movement to remind the international community that one disappearance, one death, is one too many. Over 40 mothers and other family members searching for missing migrants from El Salvador, Guatemala, Honduras, Nicaragua, Mexico, Senegal, Mauritania, Tunisia and Algeria came together to share their stories, to build ties, and to exchange experiences of searching for information on the whereabouts of their children. IOM’s Missing Migrants Project attended this historical event as an observer. The summit was convened by the Movimiento Migrante Mesoamericano and the Italian Carovani Migranti, two NGOs which assist mothers and families of missing migrants in Central America and Italy, respectively. Associations representing families of the missing sent delegations to the Summit, including the Tunisian Association Mères des Disparus, the Algerian Collectif de Familles des Harraga d’Annaba, the Mauritanian Association des Femmes Chefs de Famille, the Salvadoran Comité de Migrantes Desparecidos, the Honduran Comité de Familiares de Migrantes Desaparecidos del Progreso and the Mexican Red de Enlaces Nacionales. Rosa Idalia Jiménez has been looking for her son, Roberto Adonai Bardales Jiménez, since 28 May 2013. He disappeared when he was 14, as he fled poverty and violence in his home country towards the US border. He wanted a safer, better life. The last time Rosa heard from him, he was preparing to cross the US-Mexico border into Texas from Reynosa, Mexico. Rosa shared her story this weekend at the first-ever Global Summit of Mothers of Missing Migrants. The Summit took place in Mexico City 2–4 November 2018 as part of the 8th World Social Forum on Migration. It is not only mothers who participated in the Summit, but also sisters, brothers, fathers, grandmothers. They wear photos of the missing around their necks, in the hope that someone will recognize their loved ones and be able to help find them. They vow not to rest until their searches are over. The disappearance of a loved one, no matter the context, leaves a family mourning their loss, or waiting for news of a missing father, husband, wife, mother, son or daughter. Caught between grief and hope, families begin a search for information about their loved ones that can take years or a lifetime. Coming together around such tragic circumstances, the mothers can share their stories of pain, grief, and, above all, endless love for their missing children. Over the course of three days, mothers and family members at the Summit discussed the many obstacles they face in their search for their missing relatives. Without national or international search mechanisms, families are left to navigate a confusing web of institutions and bureaucracy with little state support. Nonetheless, they persist: the mothers’ caravan has organized annual marches through Mexico to raise awareness and search for lost loved ones since 2005. By the end of this first Global Summit of Mothers of Missing Migrants, participants mapped out a plan to globalize the struggle of families searching for missing migrants. A manifesto was collaboratively drafted on the final day of the Summit, setting out the mothers’ demands for truth and justice for their missing sons and daughters. As the way forward, the mothers agreed on a list of actions, which include joint advocacy campaigns around key events, supporting regional initiatives put forward by each association, and creating an online platform to coordinate their efforts. The Summit thus marks the beginning of a global movement of mothers and families of the missing: there is an urgent need to raise awareness about deaths and disappearances during migration and to combat indifference towards these global tragedies.